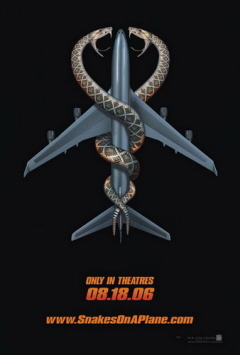 * “Snakes on a Plane“–It is what it is–a B-movie–and I liked it. The story: A man sees a mob boss murder a prosecutor in Hawaii. He and an FBI agent protecting him (Samuel L. Jackson) are on a plane to Los Angeles so he can testify in the trial against the mobster, but the mobster wants to kill him to prevent his testimony. To do so, the mobster arranges for hundreds of aggressive, poisonous snakes to be released on the plane to kill the passengers and crew and damage the flight instruments. 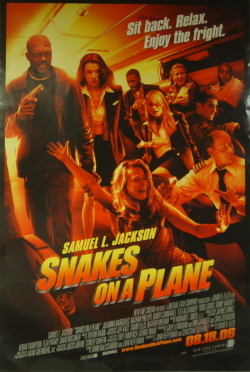 (Read here to find out how they get the snakes aboard the plane, eluding detection from security.) While many of the passengers are murdered by the snakes, together the surviving passengers–from several American walks of life–band together to fight off the snakes. Seeing it with a theater full of all-male “Snakes” fans was like like going to see “The Rocky Horror Picture Show.” Though some real snakes were used in the movie, a lot of the snakes were computer generated images, so they didn’t real or as scary. Nevertheless, I still screamed and jumped in my seat a lot–chills down my spine the whole time– though I was the only one. None of the guys screamed. There was a lot of “snakevision,” allowing you to see through the eyes of the snake, where he’s about to strike. Recommended, but NOT for the faint of heart. Gory and creepy. This movie will definitely become a B-movie cult-classic. 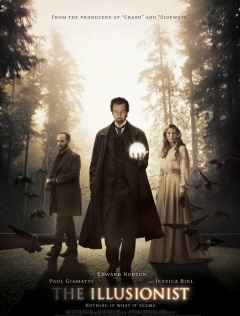 * “The Illusionist“–THIS IS ONE OF MY FAVORITE MOVIES OF THE YEAR! I loved it. Even though it’s a period piece (circa late 1800s) and has romance, it’s not a chick flick and has several big stars. Guys and women will be charmed by this story of Eisenheim, an illusionist–a magician (Edward Norton)–who performs amazing feats. His fantastic tricks are the focal point of the plot. David Copperfield and Harry Blackstone have nothing on Eisenheim. At the time of the Habsburg in Vienna, Austria, Eisenheim–the son of a carpenter commoner–is trying to win over the beautiful Countess (Jessica Biel), who was his childhood friend, from whom he was separated as a matter of class. She is about to be engaged to the Crown Prince, and Eisenheim performs amazing magical feats to a growing following of Austrians. He is under the investigative and repressive eye of the pandering Inspector (the magnificent Paul Giamatti) and the violent, jealous Crown Prince, who fear his magic show will spark a revolution and want to stop his relationship with the Countess. If you see any movie this year (other than “United 93” and “Invincible“), make it this one. Light and enjoyable. What the movie-going experience is supposed to be about. FANTASTIC! * “Trust the Man“–Trust this woman, and skip this awful waste of time. David Duchovny, Julianne Moore, Maggie Gyllenhaal and other actors you don’t care about play self-absorbed New York City characters about which you care even less. The movie is about their dysfunctional relationships. Who cares? No-one. And certainly not enough to waste 103 minutes on this lousy, boring movie with a sappy, predictable ending. Tell Oscar the Grouch to get out of the trashcan. We need to make room for this garbage. Hey Debbie: I’ve read lots of info on “The Illusionist.” Wasn’t his last name “Eisenheim” not Eisenman??? OOPS! YOU ARE CORRECT. MY MISTAKE. AS THEY SAY, HASTE MAKES WASTE . . . AND MISTAKES. CORRECTED. You remain one of my favorite bloggers, but I have to say tht my chiahuahua and other dogs are much more than “dogs” to me–and I think that PETA people are nuts! Also, if the chiahuahua gets hurt in this movie, I won’t go see it. I’m still traumatized by “Old Yeller”, even though it’s been more than 40 years since I saw it at the drive-inn in Winters, Texas. Sorry, but I’ll have to give Illusionist a miss – the Crown Prince (married to a Belgan Princess at the time) shot himself in the 1880s, Hapsburgs could only marry other royalty if they wanted the wife to have the title (Franz Ferdinand, heir at the turn of the last century, WAS married to a Czech countess, who could not be promoted to royalty) – know too much to enjoy the movie, I guess. Too much like the old operettas, maybe. I have been just dying to see “The Illusionist” since first seeing the trailer many months ago. Unfortunately, it has not been released in any theatres in my area as of yet, thusly I was forced to go see Snakes which I did enjoy.